Use Treats & Praise Liberally! Almost any normal, well-adjusted pet can be easily trained to use a pet door by using a few simple guidelines. Normally, pets are so happy to be able to go outside that training is a breeze. 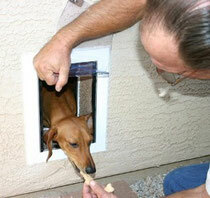 However, your pet doesn't know what a pet door flap is at first so he will need to be shown how it works. Training isn't difficult. The only mistake to avoid in training is creating fear of the pet door. Try your best not to frighten your pet! He may associate his fright with the pet door and not want to go near it again. Probably the most common way to frighten is to shove him through the pet door. This creates or worsens fear and does not teach your pet what you want him to learn. Limit training sessions to no more than 10 minutes at at time. Coax your pet through with a treat, then praise and reward him for going through. Never scold or punish - it's counter-productive and makes the process much more difficult. Do not force or push your pet through the pet door. This is a new experience for him and he needs time to adapt. Hold the flap open for your pet all the way at first, then less and less so that he gradually gets the idea of pushing against it to get to his treat. If your pet has trouble or hesitation opening the flap, try removing the magnet for a while so the flap is easier to push. Our Endura Flap based pet doors allow for all magnets to be removed to facilitate training if needed, as do all Hale Security pet doors. You may also be able to remove the magnets from other flaps, though you could damage the flap in the process. Electronic pet doors all make a sound when they activate, and that can spook a nervous or timid pet. If this sound bothers him at first, try disabling the electronics for a week or so while he becomes accustomed to the flap. Show your pet that the flaps are easily movable and not an impassable barrier. Do this by gently flipping the flaps open. If you experience trouble during the training process, please call us at 205-982-5196 for free advice and suggestions.